NWSL Week 24 preview: Which Cascadia city will host a semifinal? Twenty-four game weeks (or five and a half months) ago, the sixth NWSL season loomed ahead. By the end of Saturday, it will be over, at least the regular season, and the lifespan of NWSL will equal to the durations of the WUSA and the WPS combined. It’s been a summer of extremes – while the Shield race went unchallenged, one team is on the verge of a winless season – of dramatic blockbuster trades, of triumphant returns (Amy Rodriguez) and seasons lost (Yael Averbuch), and of rookie debuts ranging from disappointing to pleasantly surprising. With all playoff spots finally sealed up, it’s all about jockeying for final table standings as the NWSL regular season wraps up in week 24.
Who will host the semifinal? While Portland and Seattle matchups are always ones to watch, no one knew at the beginning of the season just how much weight this one would carry, and no outside party is watching with more at stake than Chicago. The winner of this match will host a crucial semifinal, and if Seattle wins, Chicago could also sneak into the third place spot, forcing Portland to travel across the country to North Carolina for their semifinal. So to say there’s a lot at stake is putting it lightly. There’s no doubt this match will be both fast-paced and physical. This is a no holds barred match on a good day, much less one that will play a big role in their playoff futures. That means very open, end to end, and likely with plenty of opportunity for free kicks, which could play a huge role in this match. One caveat here is that Vlatko Andonovski is going to play it safe with Megan Rapinoe, losing a big weapon with her set piece delivery if she’s not on the field. If she is on the pitch, keep an eye on how Ellie Carpenter approaches the match, as Rapinoe had a bit of friendly, if mocking, banter to say about the young Aussie after the Tournament of Nations. Which team can end a lost season on a high note? By many preseason accounts, Orlando was going to be in the playoffs, and Sky Blue, while expected to struggle without Sam Kerr, was probably going to be solidly mid-table. Fast-forward to September, and Sky Blue is facing last place with one final chance to win a game this year. Meanwhile, Orlando is in a disappointing seventh–although they could climb to fifth–plagued by a sputtering offense and a defense that collapses once it gives up a goal, resulting in the league’s third-worst goal differential. While this game doesn’t have the intensity or meaning of Portland versus Seattle, this teams have a lot to play for, too. For Sky Blue, it’s simple: they want to avoid becoming the first team in the NWSL to finish a season without a win. They’ve come close, but whether it was bad luck or their own fault, they haven’t managed more than six draws. 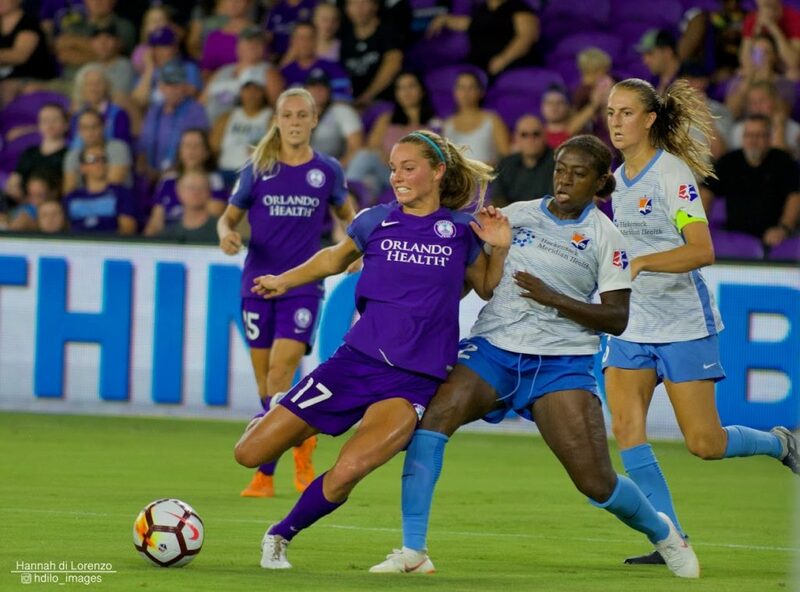 They didn’t even lead a game until their last match against Orlando, but the Pride fought their way back into the game and were denied a late-game winner by the hand of Carli Lloyd (literally). For Orlando, it’s proving they have more than just paper talent. That starts and ends with defense: they only have five shutouts on the year, and they’ve give up two goals or more in over half their games, including both matches against Sky Blue. Can Chicago finish unbeaten in two months? When a playoff spot is clinched, the question is often asked if the coach will try to rest his players in remaining games or if he’ll try to maintain momentum. Last year, Rory Dames rested his starters in the final match of the year, and it wasn’t pretty. The memory of that plus the unbeaten streak that Chicago currently enjoys is likely to push him in the other direction. They’ll know going into this match if third place is still a possibility, but if it is, they also have to defeat Utah to secure it. Expect Julie Ertz to slot right back into central defense, although Katie Naughton is more likely to be the one tasked with marking whichever target forward Laura Harvey decides to go with (probably Amy Rodriguez), as Ertz tends to push up the field more often. 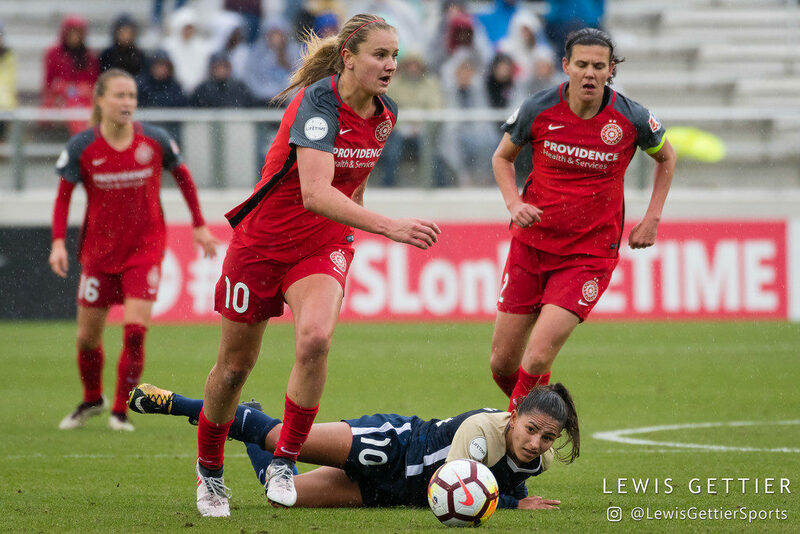 Ertz’ ball-winning talents and abilities to quickly restart attacks, as well as her vocal leadership, are two big pieces of the Red Stars puzzle. Ultimately, with the team on a seven-game unbeaten streak, the most important thing is to keep up the confidence and chemistry that the Red Stars have been demonstrating since July. What does North Carolina look like without Zerboni? 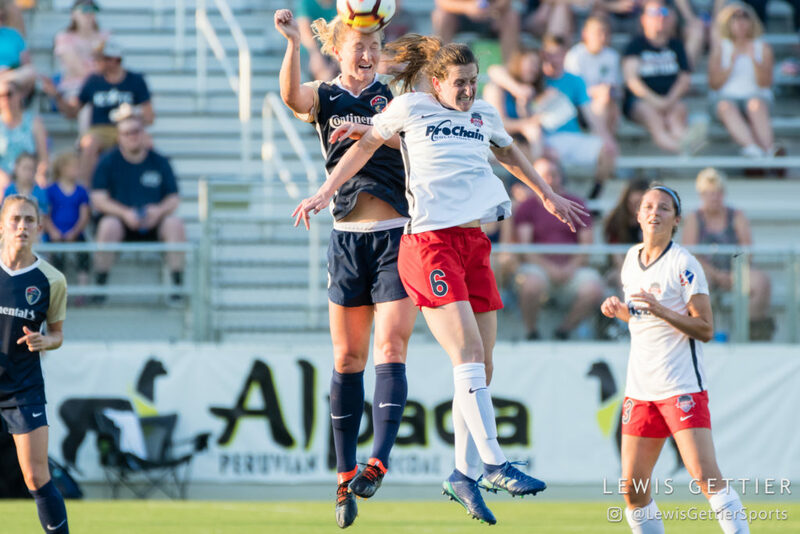 NC Courage midfielder Samantha Mewis (5) and Washington Spirit midfielder Andi Sullivan (6) during a match between the NC Courage and the Washington Spirit in Cary, NC in Week 7 of the 2018 NWSL season. Photo by Lewis Gettier. We got a glimpse of a Zerboni-less Courage in their last match against Chicago, and it was clear something was missing. This game, essentially meaningless to the Courage (although not to the Dash, who still have a chance to finish in fifth place), is the perfect time to find out. And it’s more than just plugging in another midfielder. Paul Riley has plenty of great center midfielders, but he doesn’t have another true enforcer like Zerboni. The answer is probably in having Sam Mewis play a deeper role – more of a six than an eight – but she’s not as physical a presence as Zerboni. The Dash are playing with plenty of attacking confidence lately, so the role of the number six will be essential in breaking down the transitional attack Houston relies on. 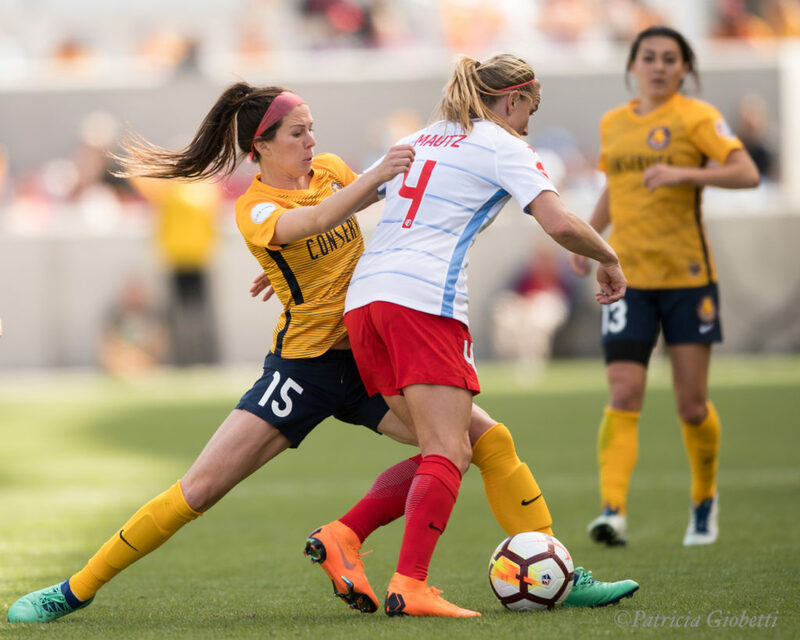 Mewis will particularly need to keep an eye on Rachel Daly, who is finishing the best season of her career, as well as the runs of Kyah Simon, who likes to arrive late into the box to pounce on rebounds. Should Mewis be successful, the attack will push more onto crosses from the flanks. Keep an eye on Kealia Ohai versus Merritt Mathias, especially as Mathias tends to get reckless if beaten. Jane Campbell: Fresh off winning the Nordic Cup with the U-23s, Campbell is wrapping up what was a quietly solid last month of the season. The Sam Kerr-Yuki Nagasato partnership: The Red Stars probably owe their playoff run to the chemistry between these two. Sarah Killion: It hasn’t been a banner season for the midfielder, but her last two matches have been her best all year. Orlando’s backline: Blink and you’d be forgiven for wondering why they headed into the locker room at 0-2 instead of 0-0 at halftime of their last match against Chicago. Making Sky Blue play on 48 hours’ rest: This doesn’t really need explaining, even if it was a no-win situation. Injuries during international friendlies to players on playoff teams: No injury is a good injury, but watching Zerboni and Short go off the pitch caused blood pressure to rise for many.